The Denib Sander is used on a linear finishing line to either finish sand before final coat or wipe excess product from the surface of the material being finished. The Sander incorporates a hand wheel attached to a ball screw for vertical travel and a tilting head to allow for abrasive change. 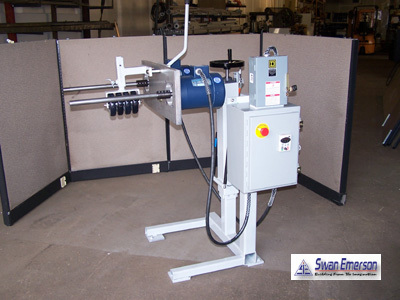 The Denib sander uses two 1 hp motors to drive the abrasive heads and an AC drive to control direction and speed.